I am a big time shoes person. I love love love shoes. Always have. I am super excited because I know I am receiving some really awesome shoes as birthday gifts. I am getting antsy with anticipation and have shoes on the brain, so I decided to do a little "safe" Etsy browsing. I say safe because I was browsing vintage shoes and since I have ginormous (size 10 wide) feet, there is no danger of me finding anything I could actually wear. Instead I can just lust after these beauties. 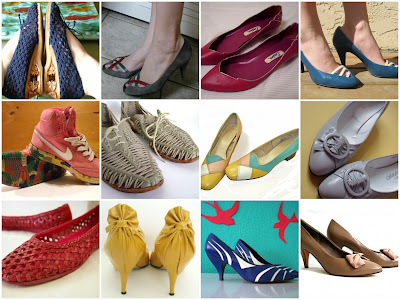 As you can tell from the photos above, my tastes run the gamut of styles, but I am drawn to pumps and would say the overlying theme is "funky." Listing info below. What a great bunch of shoes..I have to admit, they are all nice. I just love vintage. The quality is amazing.